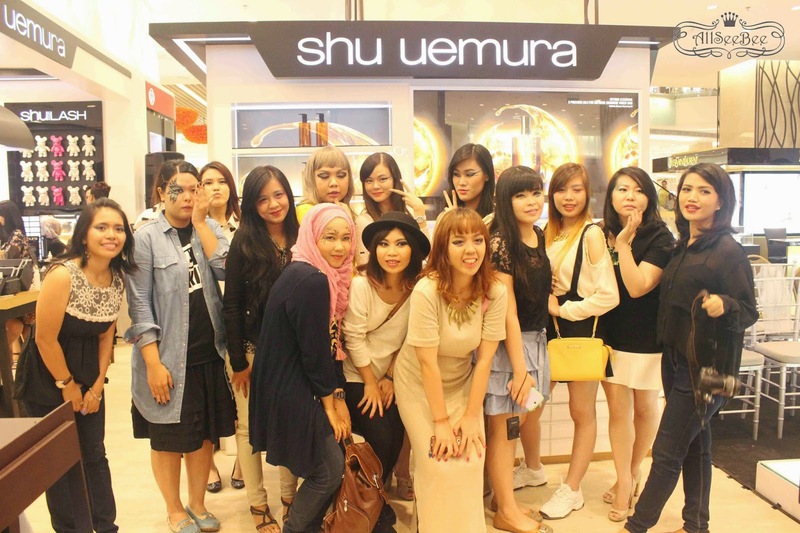 Yesterday, 13 beauty bloggers and I were Invited to Shu Uemura Make Up Event at Lotte Shopping Avenue Jakarta. There were two sessions for the event, first session at 3 PM and second session at 6 PM. I chose to came at the first session. These are Shu Uemuras's latest collection, Bijoux Spring/Summer 2014. The new family member of the LightBulb Family, the LightBulb UV Compact that has unique two sides sponge. One side for applying and building up the coverage and the other side for polishing the skin to give extra glow finish. This compact can be used dry or wet. 1. Apply make up base with the LightBulb sponge (I'm sorry, I didn't remember which Shu Uemura make up base used in this demo T,T). 2. Apply the LightBulb Foundation. 3. Apply the LightBulb UV Compact in dabbing and gliding motion with the skin-soft sponge side and then polish with circular motion with the skin-smooth side of the sponge. 4. 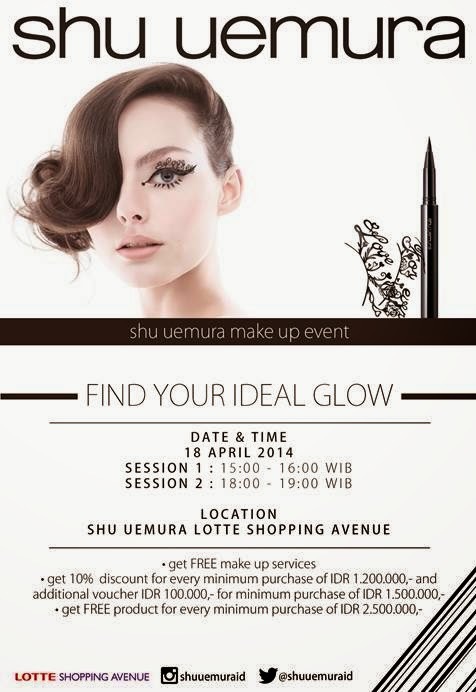 Draw the eyebrow using the Shu Uemura Hard Formula Brow Pencil. 5. 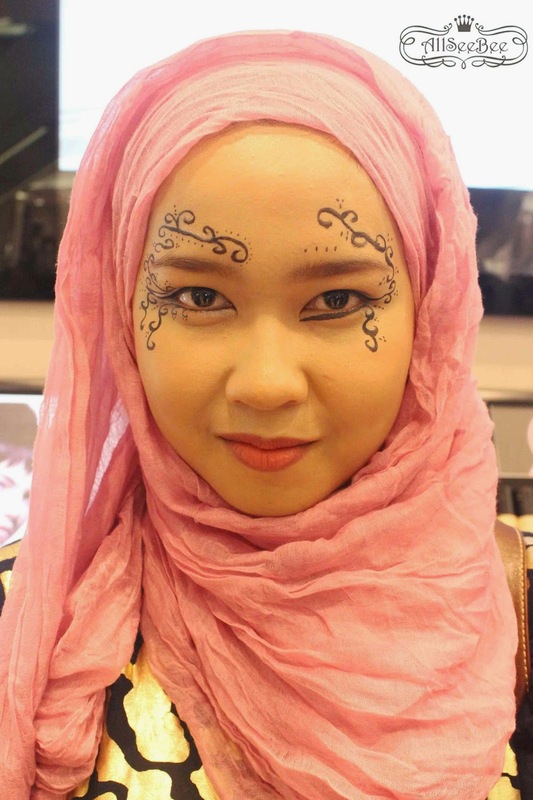 In this Demo, the make up artist used Shu Uemura Heart-full Pink Parallel Palette without any primer. 6. (6a) The make up artist start drawing eyeliner by filling the gab in the lash line with pencil liner, in this demo the make up artist used Shu Uemura Drawing Pencil in Black. Why not use the liquid eyeliner in this step? some people have sensitive eyes to some eye make up products and to avoid the 'ink' get to your eyes, (6b) Then she continue draw eyeliner with Shu Uemura Calligraph:ink on the right eye and then continue draw paperlash-looking eyeliner on the left eye (6c). 7. The make up artist (if I'm not mistaken) used blush from the Heart-full Pink Parallel Palette and she also used white shimmery eyeshadow from the same palette to highlight the browbone and under the eye. 8. Last, apply Shu Uemura Rouge Unlimited Supreme Shine lipstick. After the make up demo, we--the beauty bloggers--and some other customers filled the Shu Uemura counter. As for the beauty bloggers, we tried to create make up look inspired on some make up look that created by Shu Uemura Indonesia Make Up Artists. The tip of this Calligraph:ink was created based on Calligraph brush that can make effortless eyeliner stroke like I did here. This is how my version of 'Dancing Line' created with Calligraph:ink.